There’s a subterranean layer to Instagram. 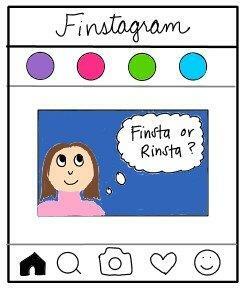 Young people share via real Instagram accounts, called rinsta, and also fake accounts, called finsta. Why Fake Accounts on Instagram? A fake account lets these users post videos and photos that they don’t feel comfortable posting on their real accounts. They are usually funny and often embarrassing. Some are sexual in natural, though only a percentage. A few are actually scandalous. It is also the favorite avenue of cyber bullies. Since they are fake, the accounts offer bullies anonymity. They can humiliate and ostracize fellow students and girls in their social networks. What all of the Finstra posts have in common is the fact that the users don’t want to be identified with them. Using a fake account solves the problem: they can share, but still keep their genuine accounts free of awkward photos. Most of the users are female and young. Kids of 9 and 10 are common. Most are teens, some are in their 20s. Most of the young girls are Caucasian. Boys also use these fake accounts, but not to the degree girls do. Even if the teens don’t post much to their fake accounts, almost all of them have one. It’s a way to keep an eye on current social ranking in their network. By staying abreast of current posts, they can also figure out if they are becoming a target. Finstas are called the “Wild West of social media” by online experts. Anonymous and no long under the scrutiny of nosy parents, teens can give their alter ego free rein. Their posts can express angst, let them explore their emerging sexuality, and serve as an outlet for social rivalries. Most teens think it’s fun when they first create an account. But eventually they get smacked by the dark side. The bullying can become intense and soul-destroying. Malicious posts can turn a fun kid-zone into a humiliating, frightening online monster. Counselors who specialize in cyber bullying recommend that parents research finstas. They should open up a free and non-threatening discussion with youngsters and teens to better understand the impact these accounts and their posts have on the kids.